OOH FANCY THAT: .. whaaa?? 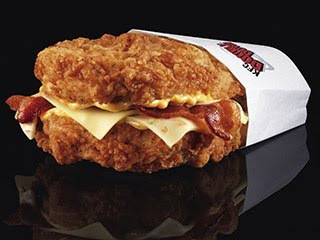 ..
Two pieces of fried chicken smashed together with bacon, cheese, and sauce = KFC's Double Down = Someone's idea of a freakin' sandwich = ??? This is wrong, but is it so wrong, it's right?? ?